Could These Futuristic Buildings Really Change Human Behavior? When we imagine enormous cities of the future, we don't always think about how they might change our behavior in urban areas. But these architectural proposals don't just look gorgeously futuristic — they're designed to be social and environmental experiments. Behold The Architecture Of The Future! The architecture and design magazine eVolo runs an annual competition to "recognize outstanding ideas for vertical living through the novel use of technology, materials, programs, aesthetics, and spatial organizations." Humans have always looked optimistically to the future, but we love the vision that these architects and designers have because each of the entries also recognizes that innovation for city life must address the environmental and societal problems with which we will continue to struggle. They account for problems like pollution, garbage, social stratification, and the emulsion of cultures. Can Azerbaijan Really Turn Its Polluted Bay into a Futuristic Resort? Biggest garbage dump: Oceans or Space? From designs that scrub the pollution rising from LA freeways out of the air, to an open ocean vacuum, to a vertical train system, these rendering present a hopeful, socially conscious, slightly fantastical, imagining of the future. Here are some of our favorites. By Yong Ju Lee of the United States, the design (pictured above) was this year's first place winner. It's a vision for the future and retains elements of the past. 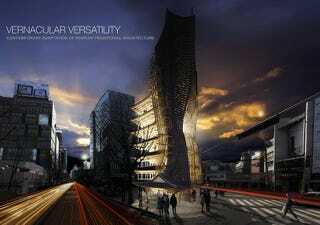 This design, by Ziwei Song of the United States, received an honorable mention. It attempts to make LA's sprawl just a bit more manageable by connecting four geographically, culturally, and economically disparate communities, and cleans the smog rising from the freeways that pass underneath at the same time. The artwork reminds us of a bit of Walt Disney's vision for the Experimental Prototype Community of Tomorrow (EPCOT). The interchange [of the] 101 and 110 breaks Los Angeles's east urban fabric into four disconnected quadrants: Downtown, Chinatown, Echo Park, and Temple Beaudry. The four quadrants have distinct cultural and social differences, lacking a coherent urban tissue. Moreover, the leftover space around the freeways reaches over 27 acre. Skyvillage aims to reclaim this terrain and provide green filtering towers to clean the freeways and also articulate various programs to revitalize the disconnected urban fabric. This honorable mention comes from the UK-based Christopher Christophi and Lucas Mazarrasa. Their design recognizes the need to rapidly move large quantities of people and materials throughout the sky-cities of the future. The Hyper-Speed Vertical Train Hub aims to replace existing flagship train stations and create new key connective points for the exchange of people and goods with the new hyper speed network. The proposal will 'flip' the traditional form and function of the current train station design vertically, and re-form it into a cylindrical mass to increase the towers train capacity. This tall cylindrical form aims to eliminate the current impact that traditional stations have currently on land use, therefore returning the remaining site mass back to the densely packed urban Mega City. This remaining land will surround the base of the tower forming a large urban park, leading towards to the base of the Hyper-Speed Vertical Hub. Another honorable mention went to this design by Sung Jin Cho of South Korea. Taking inspiration from nature (baleen filters?! ), the sea-scraper is consistent with the realization that the future of humanity likely includes more - not less - trash. Especially little bits of plastic floating in the suptropical gyres. Head on over to eVolo to look through each of the three winners and twenty honorable mentions.